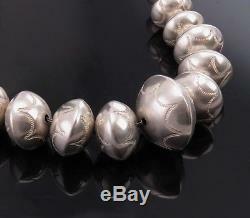 Handmade Sterling Silver Native American Old Pawn Hand Stamped Bead Necklace 24. Presented is a very pretty and flattering necklace made in the mid-1900's of Navajo pearls in a sterling display of endless rainbows! This necklace consists of graduated sterling silver beads on a silver chain finished with a substantial hook and loop closure. There are seven sizes of beads in all, from the smallest at 7 millimeters to the single and largest bead at 25 millimeters. 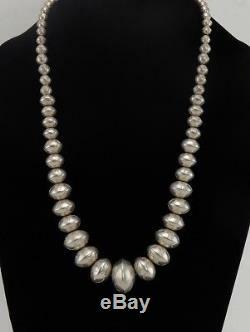 At the clasp ends are small bench-made Navajo pearls (38 in all). Starting with the third largest beads, are hand-made and hand-stamped "seed" beads (wider than they are tall). The hand-stamping on these (27 stamped) beads features series of rainbows, displaying exquisitely fine textural lines and graphic artistry! Please check out the close ups in our photos! The condition of the necklace is very good. The beads look great and the chain and closure are strong. With very close scrutiny, you can find two bench beads with a tiny pinhole at the seam, but they are definitely hard to find without magnification. The hook and loop at the chain ends are reinforced with solder and this may or may not be original to the necklace. Length: 24 inches Weight: 72.4 grams tm. Powered by SixBit's eCommerce Solution. 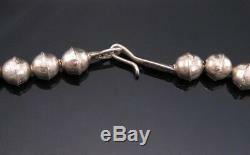 The item "Handmade Sterling Silver Native American Old Pawn Hand Stamped Bead Necklace 24" is in sale since Thursday, December 27, 2018. This item is in the category "Jewelry & Watches\Ethnic, Regional & Tribal\Native American\Necklaces & Pendants". The seller is "essexriverantiques" and is located in Essex, Massachusetts. This item can be shipped worldwide.